Huzefa Dewaswala, a master’s student in department of civil and materials engineering’s construction engineering program, was a key member on the winning team during the recent Student Days Conference, which was part of the 2018 National ASCE Construction Institute’s Heavy Civil Competitions in San Diego. The Construction Institute brought only 35 students to the conference and team competition. 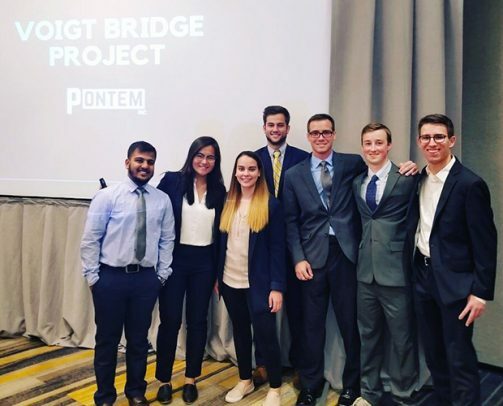 Five teams created written and oral proposals to build the Voigt Street Pedestrian Bridge, a component of the Mid-Coast Corridor Transit Project in San Diego. Dewaswala’s team, Pontem Inc., was awarded the winning bid, and consisted of teammates from Stony Brook University, Princeton University, University of South Florida, New York University, University of Kentucky, and Purdue University. He joined the team after Nelsy Badia, of Stony Brook University, connected with him on LinkedIn. “I liked her ideas of diversity in the team and leading the team of people with different backgrounds, so I decided to be a part of her team,” Dewaswala said. Apart from the diversity, Dewaswala was enticed by the two key roles he was responsible for overseeing. While Dewaswala and his teammates faced strong competition, they worked hard and put together a proposal that set them apart from the others. Dewaswala said he was grateful to be part of the competition and the entire conference as it provided real-world experience. His success at the conference stems from his work at UIC, where he has excelled as a student and worked on projects that prepared him for the competition. “[Dewaswala] is one of our excellent students and I have great confidence in his professional and career success,” said Hossein Ataei, clinical assistant professor of civil and materials engineering. Learn more about the department’s Construction Engineering and Management program at CME Research Areas.